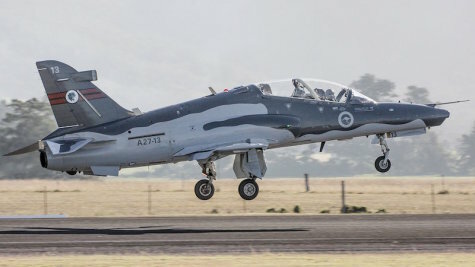 Minister for Defence, the Hon Christopher Pyne MP, today announced the completion of the final aircraft in a significant modification program for the Royal Australian Air Force fleet of Hawk Lead-In Fighter aircraft. Minister Pyne said the milestone was important in ensuring we have a world-class training capability. “Completion of the aircraft modification program means the Lead-In Fighter training capability is well positioned to support Air Force’s fast-jet pilots for transition to the next generation of fighter aircraft including the Joint Strike Fighter, Super Hornet and Growler capabilities,” Minister Pyne said. Operated by Numbers 76 and 79 Squadrons at RAAF Bases Williamtown (NSW) and Pearce (WA), the Hawk fleet comprises 33 aircraft and is used to train qualified RAAF pilots to operate the next generation of fighter aircraft. The 33 aircraft upgrade began in 2014 and finished on time and within budget. Each upgraded Hawk aircraft provides new training capabilities including simulated radar, electronic warfare, digital mapping, ground proximity warning system and traffic collision avoidance. The Australian Hawk Mk127 fleet has been an integral part of the fast jet training system since 2001, enabling the RAAF to produce highly trained aircrew for life in the cockpits of combat aircraft including F/A-18 A/B Classic Hornets, F/A-18F Super Hornets and EA-18G Growlers. The modified aircraft provides the RAAF with a Lead-In Fighter that is comparable with the Royal Air Force (UK) Hawk T2 Advanced Jet Trainer and ensures the Australian Hawk aircraft is suitable for a fifth-generation air force, preparing pilots for fast jets including the F-35 Joint Strike Fighter. The project has involved BAE Systems engineers in the UK and Australia, BAE Systems and RAAF technicians, and industry partners CAE and Cubic Defence Applications Inc have played pivotal roles. The upgrade includes the replacement of two legacy synthetic training devices with three full-mission simulators provided by CAE and the incorporation of an Air Combat Manoeuvring Instrumentation capability on to the aircraft by Cubic Defence Applications Inc.
BAE Systems Australia Chief Executive Gabby Costigan said: “With this extremely capable upgraded Hawk aircraft, the RAAF has a world-class Lead-In Fighter that is ready to deliver high calibre pilots for the F-35A Joint Strike Fighter.